ST. LOUIS – For the 26th year in a row, Webster University ranked first among non-profit private and public institutions for the number of degrees awarded to African American graduate students. The University also was second for the number of graduate degrees awarded to any student who self-identified as an ethnic minorities among all non-profit private and public colleges and universities in the United States. In Missouri, Webster had the most diverse population of graduate degree earners, according to Diverse Issues in Higher Education (DIHE). DIHE’s “Top 100 Degree Producers” survey for 2017. The study was released earlier this week. It is the only national report of graduate degrees earned by African American, Hispanic, Asian American and Native American students by U.S. colleges and universities. This is the 26th year that DIHE has published their report. Webster has consistently achieved top rankings in the survey since it was first published in 1991. More than 51 percent of all Webster students completing a graduate degree last year self-identified as a minority ethnicity. The complete DIHE “Top 100” survey can be found in the Aug. 24 issue of the magazine. “Webster University has a strong historic commitment to educating a globally diverse community,” said Webster University President Elizabeth (Beth) J. Stroble. “From our vigorous financial aid program and excellence in academics to our integrated support for student success, Webster has a mission of meeting unmet needs." The only Missouri institution to be listed in the top 100 for the “Total Minority Masters” category. The survey used data provided by the U.S. Department of Education’s National Center for Education Statistics collected for the 2015-2016 year. The survey only looked at degrees awarded and only counted students who are U.S. citizens. For the past six years, U.S. News & World Report ranked Webster University among the most economically diverse universities in the country. This ranking cites the high percentage of Webster students receiving Pell Grants, indicating they come from households that make less than $20,000 per year. 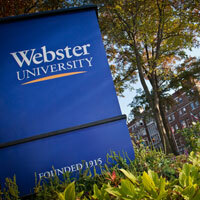 Webster University offers more than 50 scholarships to students from under-represented groups. In August, the University awarded the Donald M. Suggs scholarship to two incoming freshman. The Suggs Scholarship, awarded at Webster since 2013, is designed to increase the recruitment and retention of highly talented undergraduate students who typically are underrepresented at institutions of higher education. Earlier this year, Webster University was named by CollegeNET as one of the top schools for “Social Mobility” in the St. Louis region and the sixth best school among all private non-profit universities in the United States. The University also was one of five institutions of higher education lauded by the non-profit St. Louis Graduates and the St. Louis Regional Chamber of Commerce for graduating low income, first generation, underserved minorities with comparatively low debt. With its home campus in St. Louis, Missouri, USA, Webster University (www.webster.edu) comprises an action-oriented global network of faculty, staff, students and alumni who forge powerful bonds with each other and with their communities around the globe. Founded in 1915, Webster is a private non-profit university with nearly 16,000 students studying at campus locations in North America, Europe, Asia and Africa and in a robust learning environment online. The university is committed to ensuring high-quality learning experiences that transform students for global citizenship and individual excellence.